On Saturday June 30 at 4pm, Matt O’Connell from Rainbow Beach IGA would like to have ‘drinks for Pete’ down at his seat in Phil Rogers Park, Rainbow Beach. Matt said, “My family and I came to know Pete very well during the short time that we knew him, as he and my oldest son Liam became very good friends. Rainbow Beach is shocked and devastated after losing one it’s most loved residents Peter Brady. 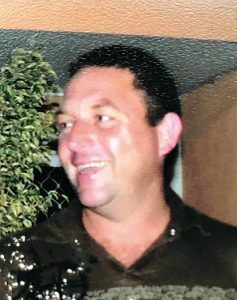 Everybody’s friend and a true gentleman, Peter had lived in Rainbow Beach from five years of age, raised here by his grandparents whom he adored. At a young age he went to work for Foodworks’ Ruth and Milton Modin, who thought of him as a son, and he stayed in their employment for many years. Many locals remember him from his time at the Shell service station, but it was later when he owned the fish and chip shop with wife Karena that most people came to know him. Generously devoting his spare time to community pursuits, Peter was Chief of the local Rural Fire Brigade and SES member for many years. In recent times Peter was the friendly face at the IGA and a sales representative for Cooloola Wholesalers. Always with a cheery greeting and a smile, Peter embraced the simple pleasures in life. Fishing with a passion, having a beer with his mates, playing Santa at the Christmas party, and giving fire truck rides to children, and a loving and devoted Dad to Liam and Jemma. These are some of things Peter will be remembered for. Tin Can Bay Resource Centre is on the move!